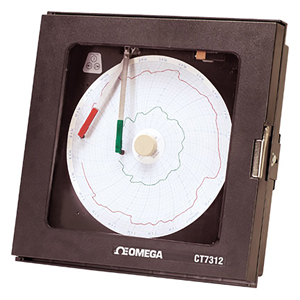 The CT7300 is an economical 2-pen circular process chart recorder that measures and records up to two process variables from a variety of inputs. Record and optional alarm settings are easily configured for multiple recording applications. To protect your process, the CT7300 battery back-up will continuously record up to 48 hours in the event of a power power loss. 참고: Circular recorder comes complete with operator’s manual, pens, battery and 100 charts. Other Range Papers also may be available, Consult Sales.